We all know our autistic children love patterns and habits. All too often, the ones they are stuck on are unhealthy or self damaging in some way. More often than not, we as parents are the culprits of setting these poor habits in motion; the autism creating a pattern. Let's take the case of the Chicken Nugget (since most of us familiar) and see how this little three step process works. I'll use Kolt as our example. 1 REMINDER: Kolt reminds me that he wants chicken nuggets for lunch but we're having tacos instead. What's his response? To run through the house yelling "Chicken nuggets, chicken nuggets, chicken nuggets, chicken nuggets, chicken nuggets!" 2 ROUTINE: I get tired after the 435th time he yelled chicken nugget so I toss a few in the oven to satisfy him and give myself five minutes of peace. 3 REWARD: Kolt got his chicken nuggets and he did it by throwing a fit. He learned if he flips out, he gets what he wants eventually so that becomes the new way to ask. For me, I got a few minutes of peace so he's conditioning me that if I want peace I better give him what he wants. I could have said "ok" the first time he said it and avoided the meltdown all together. The last time I checked, the adults run the household and we're not about to blow him up with sodium and nasty fillers.Unfortunately this is the absolutely worst approach I could have taken because when I make burgers for dinner, we start all over again, "Chicken nuggets, chicken nuggets, chicken nuggets!" This process will not work if one factor isn't satisfied. 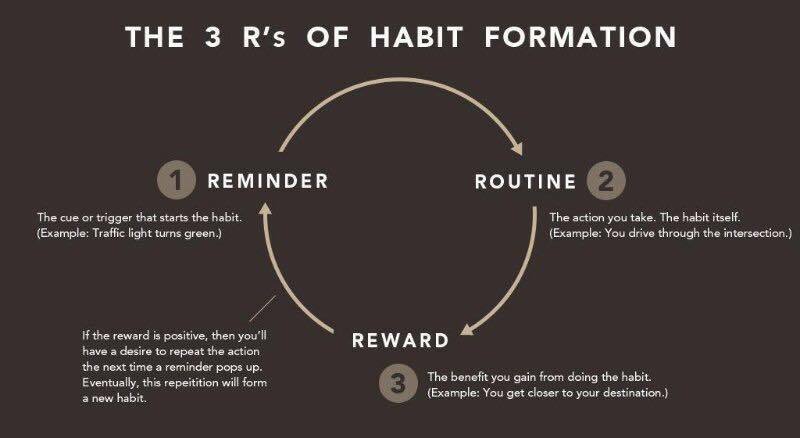 We can't do much about the Reminder, but we can when it comes to the Routine and Reward. My routine is to say what we're doing more than he can. Yes, that means telling him, "taco for lunch" 436 times. Getting that one up usually ends it and he gives up. The other factor is Reward. Chicken nuggets can't be given if they're not made or bought in the first place. Fast food can't be eaten if I stay home. However, all of this comes with dealing with the meltdown. Then you use your powerful tool of Distraction. It won't take long before chicken nuggets are a thing of the past and a new habit is accepted into the pool of patterns. It's a simple 3-step process and we can influence it more than we may think. We just have to be more patient and consistent than they are. P.S. I don't think Kolt has had a chicken nugget yet this year!